Catch up with Day's 1 & 2 here. So this was our first morning waking up in America and it was a bloody early one! With our body clocks being 5 hours ahead we were up and wide awake at around 6am (aka 11am!) so up and ready we got and we wrapped up seriously warm because it was actually so much colder than we were expecting! Luckily we had both worn big thick hoodies from Jack Wills & Hollister for the flight - little did we know they were going to turn out to be life savers on this trip. We knew the first thing we wanted to do was to head to DASH (The Kardashian's Store in Soho) so once again the iPhone was out we had our map telling us which way to head. After around 30minutes of walking we found it tucked away a few stores down from Chanel on Spring St.. What we hadn't realised is that stores open a bit later in this part of town and DASH didn't open until 11am so instead of waiting around we took a few photos outside and vowed to go back before we left the city so we could have a look round and get some merchandise! 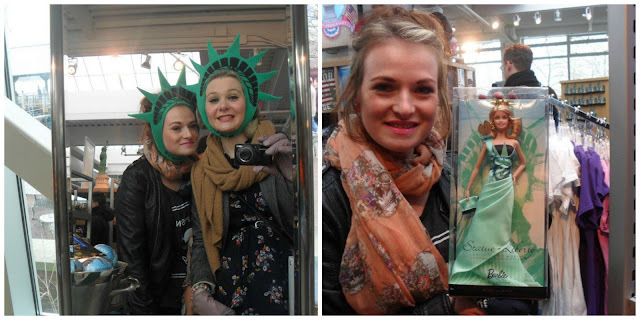 Next stop was The Statue Of Liberty (yup, today was going to be a sight-seers heaven) so we hailed a taxi, which is always awkward when you first get to NY but I'd like to say we are now experts, and we were on our way. Before we headed over and got our tickets we decided that we needed some breakfast, we saw a little supermarket type shop and thought we'd try out luck. Well this had everything - including a cafe area upstairs to go and eat your purchases! I settled for a chocolate chip pancake (hey I was in New York) and it was huge!! This is the first time I thought to myself their portions are huge and it wouldn't be the last! 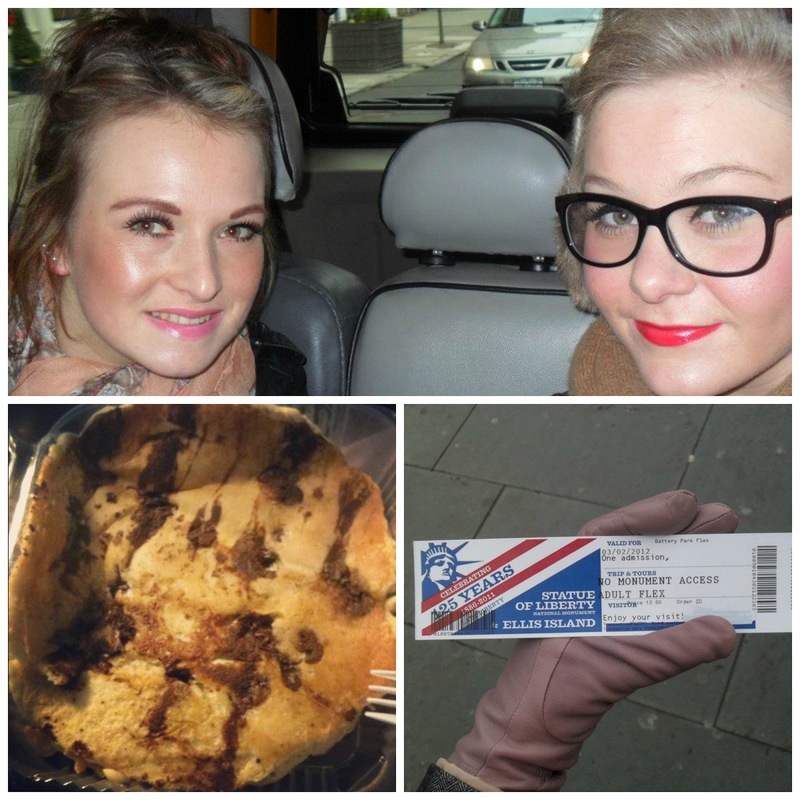 Breakfast eaten, a little bit warmer and with a few snacks bought we headed over the road and towards the ticket office. The queue for The Statue Of Liberty was pretty big but with all sorts of people waiting from all over the world it was quite a good location for people watching. Although saying this this didn't make me feel any warmer and I was so grateful that I had packed my mittens that morning! After about an hour we were in, getting our bags checked and heading towards the boat. Living on an island I am very used to ferries and this one just felt like I was at home. Growing closer and closer I was getting more and more excited, my friend had been before but this didn't make her any less excited as I. 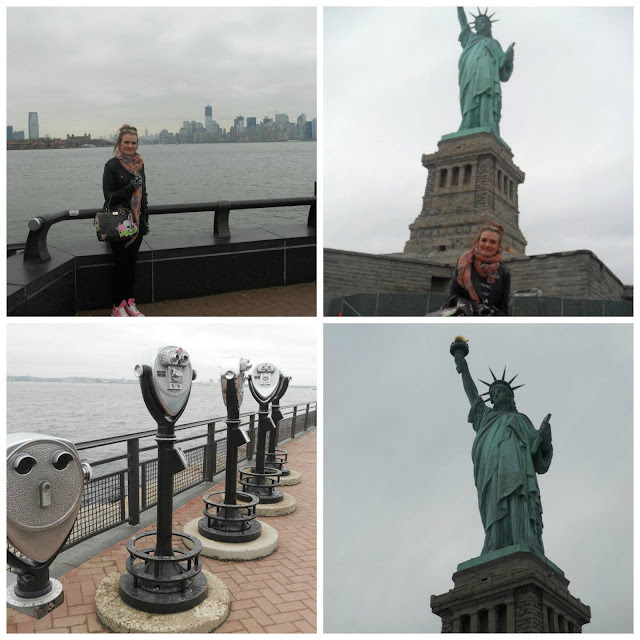 We hopped off the ferry and followed the crowds for a walk around Liberty! This was a perfect spot for photo taking and you'll get to learn from reading these posts that I do tend/love to get a bit snap happy - but I see nothing wrong with this when making memories! You can see the skyline of the city across the water and of course you are up close and personal with The Statue! We stayed here for probably around half an hour but the wind was so icy cold that we had a quick look around the gift shop, took photos with stupid hat/masks on and walked back to the ferry. Next stop on the ferry was Ellis Island but we decided to skip this as we had lots planned for this day. We got off the ferry and were greeted with street performers, these awesome guys doing some amazing dancing and gymnastics and had a massive crowd around them. after watching them for a little while we ventured off and went to ask for directions for Ground Zero. We thought we would have to get a taxi there but after talking to a lovely traffic warden (I think thats what he was anyway) he kindly pointed out to us that "that is the freedom tower right there". We weren't far from it at all so we were off on foot and heading towards the 9/11 site. I always knew it was be eerie and even standing in the queue you could just feel that everyone around us felt the same. As we were in New York is was something at the top of our list of things to do and I am so so glad we went. Obviously security, like a lot of the landmarks/tourist attractions, is tight and again we went through the metal detectors and bag searches just like at the Statue of Liberty. We went to ground zero just before the museum had opened so it was just the water fall fountains there at this point. They are incredible and the size of them just really does make it hit-home how big these buildings were and how many people's lives this affected. Ground Zero isn't somewhere you hang around for a long time and after a little while we made our way back out and into the store which is situated by the exit. Now like I said before, this was a major sight-seeing day so yeah you guessed it next stop for us was The Empire State Building. We got a taxi from Ground Zero and I can't quite remember how long it took but I can't imagine it was long! We were nervous that we were going to have to queue for ages but that wasn't a queue in sight so up we went. A fairly expensive ticket and 86 floors in a lift (elevator) later and we were at the top... and getting probably the most wind swept I've ever been in my life. What an AMAZING view. 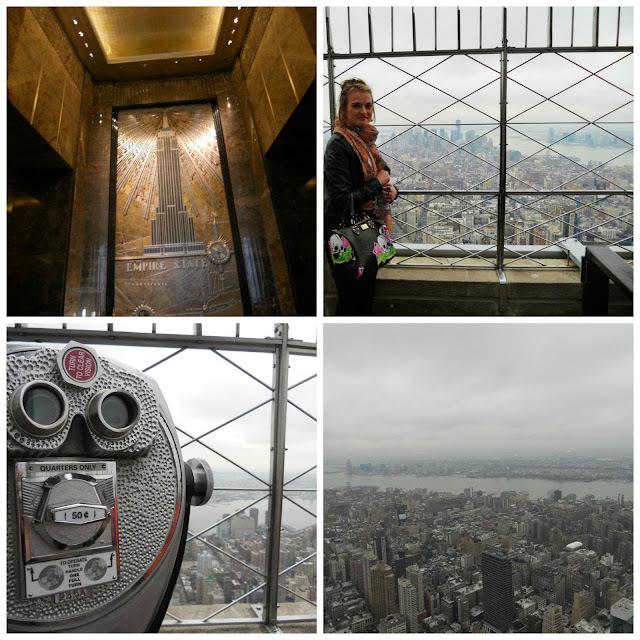 You really get to see the beauty and uniqueness of New York and I could of spent ages up there. But with the cold weather and time ticking on we decided to head back down and make our way back to our hotel. As easy as that sounds we managed to totally and utterly balls it up. We went to a store and got some food for our room back at the hotel and some well needed bottles of water. As we started making our way back to the hotel location we started to noticed that actually we had no idea where we were going. And... I may, MAY, have made a teeny tiny mistake in thinking our hotel was on 152nd when actually it was on 125th (or something like that) so after walking around 52 blocks more than needed and spending some of our trek in a part of New York I would never want to go back again to we made it back to the hotel. Baring in mind we had been up since around 6, and just carried 24 bottles of water alot further than needed, we were exhausted but our day wasn't over. When planning this trip we made sure we had tickets for a few things while we were in each state. 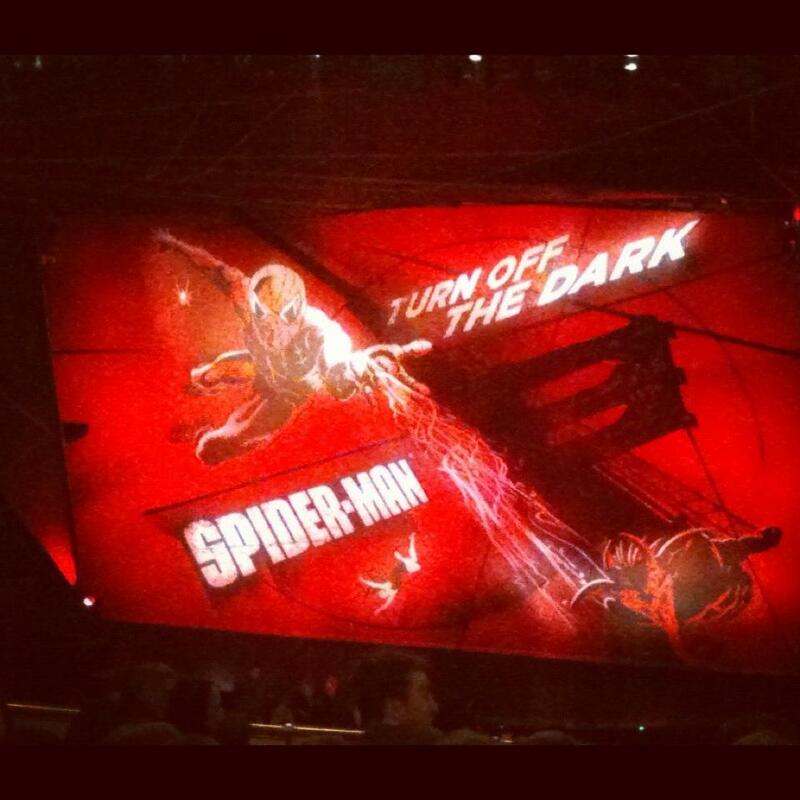 Tonight we had some of those tickets and they were for Spiderman : Turn Off The Dark the musical on Broadway. Luckily Broadway was only around a 15 minute or so walk from our hotel and we had seen where the theatre was the night we had arrived and gone to Times Square so we knew where we were going. Our seats were right at the back of the circle but this didn't matter at all - The musical was amazing. If you are in New York and wondering what show to go and see I would definitely recommended it! Where else are you going to have Spiderman running out of the door right next to you and jumping off of the balcony. So so brilliant, modern and unique with an amazing cast, storyline, soundtrack and set. (I've even got the CD and love singing along). We left Broadway and it was chucking it down with rain but instead of trying to hail a taxi with the hundreds of other people around we decided just to go for it and walk as fast as we could. And that was our first full day in New York done and dusted.